Before proceeding to create a Moneymailme business account, make sure that you are a legal representative of an organisation legally registered with a valid e-shop. When accessing the web address for the first time, user is prompted with two possibilities: log in (for an existing account) or sign up (for a new account). 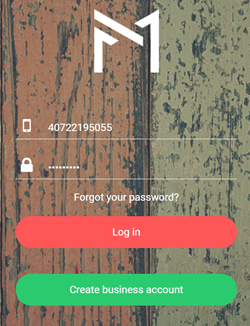 In order to create a new account, click on Create business account button. 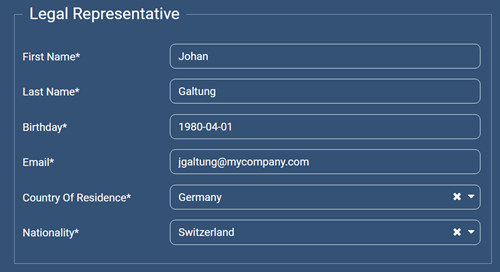 User is then moved to a registration form, where data is necessary to be input in order to create a business account on the Moneymailme platform. Company Type This is the type of establishment where your e-shop is registered: business, organization, soletrader. Company Name Name of the establishment as officially registered. Website Website of the establishment. This is not the web address of the e-shop. Make sure the value begins with http://. Email A contact email for your establishment. This is not the email address with which you are registered as a Moneymailme user. Address Line 2 Address (second line, if necessary) where the establishment’s headquarters is located. City City of the establishment’s headquarters. Country Country of the establishment’s headquarters. Choose from the predefined list. Region Region (if present) of the establishment’s headquarters. Postal Code Postal code of the establishment’s headquarters. First Name First name of the legal representative registering the business account. Last Name Last name of the legal representative registering the business account. Birthday Date of birth of the legal representative registering the business account. Email Email of the legal representative registering the business account. This is the email with which you are registered as a user on the Moneymailme platform. You can also put a generic email held by the establishment, like: support@ or contact@ or admin@. Country of Residence Country where the legal representative registering the business account resides. Nationality Nationality of the legal representative registering the business account. 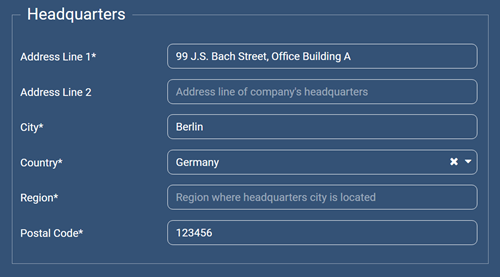 Address Line 1 Address (first line) where the legal representative registering the business account lives. Address Line 2 Address (second line, if necessary) where the legal representative registering the business account lives. City City where the legal representative registering the business account lives. Country Country where the legal representative registering the business account lives. Choose from the predefined list. 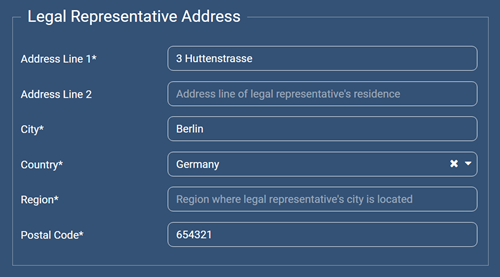 Region Region (if present) where the legal representative registering the business account lives. Postal Code Postal code where the legal representative registering the business account lives. Phone Number Country Country where your phone is located. Choose from the predefined list. Phone Number Mobile number which will be associated to your Moneymailme account. It must include prefix of the country. This can never be changed, so make sure to put a phone number which is owned by the organization creating the account. Wallet Currency Currency of your electronic wallet where payments (for orders done on your e-shops and paid with Moneymailme) will be received. The following currencies are available: CHF, EUR, GBP, PLN, USD and ZAR. The currency of your wallet can never be changed afterwards. Password Secret password associated to your Moneymailme account. It must contain at least 6 characters, out of which at least one number and one letter. Retype Password Secret password re-type. After agreeing with Moneymailme policies, confirm that you are not a robot by ticking the appropriate box. Finally, click on Create Your Business Account to become a registered business user in the Moneymailme community. Note: There are two categories of information which are required to create a user account: company data (which are public) and legal representative / contact date (which are private) and are used in the relation with Moneymailme application. the Moneymailme application is a financial application and dealing with money must be done within a legal framework. in case of frauds, if investigations need to be performed, localizing your organization is mandatory. we keep the Moneymailme business users community clean of invalid organizations or organizations who would create accounts for intended frauds. existing Moneymailme users who would pay orders from your e-shops with the Moneymailme application can trust that your e-shop is legally valid. As a registered user, you will be logged in to the Moneymailme application and you will receive a welcome email to the Moneymailme business community on the email address filled in the Legal Representative section. In order to become a validated user, for your own security, in the left side menu of the web application, click on the highlighted Validate menu. An SMS with a registration code is sent to the provided mobile number which will help verify the validity of your phone number. Input the registration code received on your mobile into the displayed page and click on Verify button. That’s it, your account is created and valid, and you have a virtual wallet in the currency you have chosen! Note: your welcome email contains a security code; you will use this to authorise transactions done on your wallet. You can now start exploring the application!